“The earth has been there for a long time. She is mother to all of us. She knows everything. The Buddha asked the earth to be his witness by touching her with his hand when he had some doubt and fear before his awakening. The earth appeared to him as a beautiful mother. In her arms she carried flowers and fruit, birds and butterflies, and many different animals, and offered them to the Buddha. 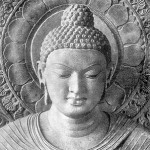 The Buddha’s doubts and fears instantly disappeared. This entry was posted in buddhism and tagged inspiration. Bookmark the permalink.